Welcome to my first Wine Blogging Wednesday(WBW) post! 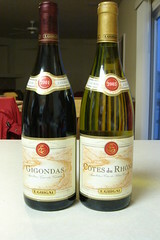 This month's theme was "When in Rhône" hosted by winexpression.com. To start our WBW participation off with a bang, we selected TWO wines from the Rhône region of southern France. For those who are unfamiliar with the region, it is most famous for producing red wines using the Syrah grape varietal, whites from the Viognier, and the historic Chateauneuf-du-Pape appellation (which approximately translates to "the new castle of the pope"). Note that the Syrah and Shiraz are the same grape. Not knowing a lot about the wine makers of the region, we consulted the wine ouija board at Whole Foods. 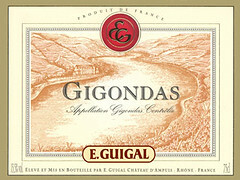 Asking the powers that be for a Rhône wine of 80+ points, it answered "Guigal". It turns out that Guigal is one of the powerhouse producers of the Rhône region. Blend: 50% Grenache, 25% Syrah, 25% Mourvèdre. A earthy/woody nose bordering between barnyard and cedar. Subtle notes of tobacco. Tastes lightly of cherry, plum and cassis. Improved greatly the next day, but still just average. A very subdued bouquet. Tastes of honey, stone fruit and well, not sure what else. Barely any flavor. Oddly buttery, not what I was expecting. By the second day, more notes of flowers and lots of mineral on the nose, but still undrinkable. Granted I'm not a viognier drinker, so this isn't my favorite wine profile to being with. My wife, who enjoys whites much more than I, thought it was pretty bad as well.